Five pet dental myths about your dog or cat. Because humans have tended to pets for centuries, a tendency to ‘know what’s best for our pet’ has flourished, carrying with it certain myths about our pets’ health. The vet dentists at Arrow Group of Animal Hospitals have heard them all – and frankly, they ARE myths, as they do not hold much modern truths. FACT: Actually, the majority of pets will not cry, whimper or act painful at all. In most cases, when an animal is in pain, pet owners will not have any indication of any distress. However, a marked improvement in pets’ well-being comes about AFTER treatment for dental disease. FACT: Most animals will continue to eat even with sore mouths and painful dental disease. That is part of their instinctual behavior. But instead of chewing, most pets will simply gulp food instead of chewing, similarly to how humans might eat with a painful mouth disease. FACT: Older pets can have perfectly fine teeth. Old age is not a disease. Having bad teeth is a result of plaque and tartar buildup due to missed dental checkups, with additional problems caused by possible abscessed teeth, infections or worse. , dental disease or more, not by species. If you smell bad breath on your pet, that’s a very strong indicator that something in their mouth is abnormal and should be checked by a veterinarian. Forget the myths, follow the facts. Contact your local Arizona veterinarian at www.Arizonapetvet.com and get your pet’s dental care back on track. And if you come in before December 31, you can save $50 on your pet’s dental cleaning with the printable coupon on the website. This entry was posted in Arizona Pet Health and tagged Arrow Animal Hospital, Glendale pet dentist, Mesa Animal Hospital, pet dental, vet dentist, veterinary dental on November 29, 2011 by AZPetVet. 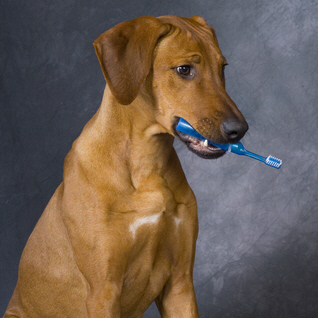 Five warning signs for dog dental health – brush their teeth! Humans very naturally take care of their teeth. Next to drinking water, brushing our teeth is probably the next most regular thing we do. But who takes care of our dogs’ teeth? And how often? Sadly, for pets, the answer is generally “not often enough”. The opportunity to help desert pet owners has never been greater and these Phoenix pet dentist want to make sure their pets get as much dental care as themselves. 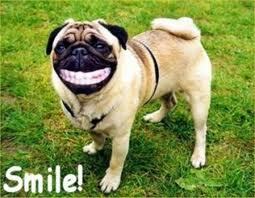 Without proper dental care, pets have increased chances of mouth-borne illnesses. This entry was posted in Arizona Pet Health and tagged Arrow Animal Hospital, dental cleaning dog, dental for dogs, dog dental health, dog dental problems, Phoenix pet dentist on November 23, 2011 by AZPetVet. Keep up with your dogs dental health. Happy Valley Animal Hospital’s Dr. Victor Saltzman explains that about 50% of pets that come in their Glendale pet dental & veterinary clinic have dental disease. 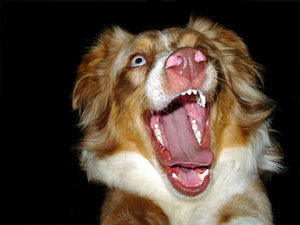 About 80% of the time the dog dental disease cannot be seen from just a regular exam. Without proper dog dental cleaning or chewing the bacteria-filled tarter turns into a hard cement-like material coating your dogs teeth. The bacteria then gets under their gums and can causes abscesses. Additionally, the bacteria can get into your pets bloodstream and cause problems with their internal organs, which could reduce your pets life by up to 25 percent. The good news is that you can help to prevent pet dental disease with proper canine dental cleaning at your local Arizona pet dental and veterinary clinic. This entry was posted in Arizona Pet Health and tagged Arizona pet dental, ArizonaPetVet, Arrow Animal Hospital, dog dental cleaning Phoenix, Glendale pet dental, pet dental disease on November 15, 2011 by AZPetVet.